This is a very interesting article written by Allison Bond for Reuters. (Reuters Health) – Blocks, puzzles and other hands-on toys that have long been mainstays of children’s play are still best at teaching some skills needed for success, according to a research review. Although so-called “screen-based” entertainment – including computers, video games and cell phones – can keep young kids occupied, technology is less effective than more traditional toys in teaching spatial reasoning to preschoolers, the U.S. researchers say. “Skills, including early geometry and knowing the names of shapes, help kids learn the math skills they pick up in kindergarten. And if they already have those (before they begin school), they are ahead of the curve,” said lead author Brian Verdine, a postdoctoral fellow at the University of Delaware in Newark. Spatial reasoning, which is the ability to visualize and manipulate objects as they would appear in space, is important in many math- and science-oriented careers, including engineering, Verdine and his coauthors write in Trends in Neuroscience and Education. Playing with blocks, shapes and other toys does more than just get kids used to looking at and manipulating these objects. When parents join in, the dialogue they provide during playtime can also provide an opportunity to learn spatial skills. 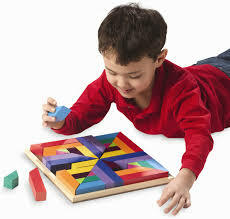 For example, comparing the size, color and position of objects teaches children how to make comparisons. “When a parent is directing the play and narrating, that kind of conversation is such good learning for children. Parents should be like sportscasters and keep a running commentary on what’s going on,” said Marsha Gerdes, a psychologist at The Children’s Hospital of Pennsylvania in Philadelphia, who was not involved in the review. Real-world play can also teach social skills, Verdine points out. “One reason these old-fashioned toys provide a lot of benefits is that they involve other play partners or adults in some way,” he said. “Parents provide a lot of additional language input, and they can respond to children in ways that electronic toys really aren’t able to do at this point in time,” Verdine said. Although screen-based toys often hold great allure for families, many experts believe they just don’t help children learn as much as real objects and interactions with other people. “Parents see that children will watch these screens and look like they understand, but they are not looking and perceiving in a way that is helping them learn. Kids are not learning as much as when they are actually looking at their parent’s face and listening to them sing a song when they are watching a pattern on a screen,” Gerdes said. Children who spend time in front of a screen – whether that’s a computer, a television or a tablet – also tend to have more attention problems, lower reading scores and an inferior ability to use spoken language compared with peers who don’t spend time in front of screens, Gerdes said. The American Academy of Pediatrics in 2013 released guidelines on screen time, advising against any screen time for children under the age of two years. Beyond age two, AAP recommends limiting screen time to one-to-two hours a day. Verdine and his coauthors reviewed prior research on the cognitive effects of different types of play. While they found real-world toys to be better at teaching spatial skills, a few electronic toys and apps can offer “bonus learning experiences,” they say. “The best digital toys can adjust the difficulty level of the task in response to the increasing skill level of a child, creating an individualized experience for the child that can increase engagement, reduce frustration, and optimize learning,” they write. Beyond blocks, parents looking for real-world skill-building activities can try other options, Gerdes noted, including materials for playing pretend, such as kitchen sets, action figures and dolls. “The literature also has been very strong in terms of skills from books and reading, both when kids read with adults and when they flip the pages or read on their own,” Gerdes told Reuters Health. Verdine’s group thinks building skills like spatial reasoning from an early age may make children more likely as they grow up to continue to pursue avenues that require a similar skill set. “The kinds of skills these toys build are related to staying in (science and engineering) subjects through college, and to being successful in those careers later. So the earlier we can start on these things, the better,” Verdine said. “If you’re better at age three, you’re probably going to be better at it later. It’s a cumulative effect as you continue to build those skills,” he said. SOURCE: bit.ly/1meGLPX Trends in Neuroscience and Education, online March 14, 2014. This article is very informative. We do not agree with a total ban. As my sister always says, “Everything in moderation!” We do, however, feel the research and information on the effects of technology on child development is something to think about. Toys are the tools by which a child learns. Social interaction is crucial to child development. Pushing a button on a handheld game or computer will not teach children reasoning and deduction, as creating a train track setup or putting a puzzle together does. Play should be real (not virtual). It should be active and creative. And through play children, will acquire knowledge and develop skills.